Qu Yuan (Chinese: 屈原; pinyin: Qū Yuán, Ch’u Yuan) (ca. 340 B.C.E. - 278 B.C.E.) was a Chinese patriotic poet from southern Chu during the Warring States Period. Born into a noble family, he achieved a high position in the court, but was slandered by his enemies and sent into exile. In 278 B.C.E., King Chu was captured, and the capital, Ying, was taken soon afterwards by General Bai Qi of the state of Qin. Upon receiving this news, Qu Yuan is said to have written the lengthy poem of lamentation called "Lament for Ying" and later to have waded into the Miluo river in today's Hunan Province, holding a great rock in order to commit ritual suicide as a form of protest against the corruption of the era. Qu Yuan is considered the first prominent Chinese poet. Twenty-five of his poems are found in an anthology of poetry known as Chu Ci (楚辭 Songs of Chu, sometimes Songs of the South). He initiated the style of Sao, abandoning the classic four-character verses and using verses with varying lengths to give his poems a more flowing rhythm and greater latitude of expression. Qu Yuan is also regarded as one of the most prominent figures of Romanticism in Chinese literature, and his masterpieces influenced some of the greatest Romanticist poets in Tang Dynasty, such as Li Bai and Du Fu. His death is commemorated on Duan Wu or Tuen Ng Festival (端午节/端午節), commonly known as the Dragon Boat Festival in the West. 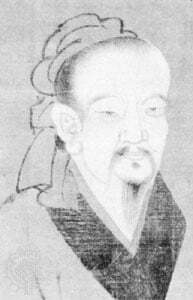 Qu Yuan was born around 340 B.C.E. to a noble family in the southern state of Yu minister in the government of the state of Qu, in the Yangzi River (Chang Jiang) valley. Qu Yuan was a gifted scholar, and attained a high position at court. A champion of political loyalty and truth, eager to maintain the Chu state's sovereignty, he advocated a policy of alliance with the other kingdoms of the period against the hegemonic state of Qin, which threatened to dominate them all. According to legend, the Chu king fell under the influence of corrupt, jealous ministers who slandered Qu Yuan, and banished him. It is said that Qu Yuan returned first to his family's home town. He spent much of his time in exile traveling the countryside, collecting legends and rearranging folk odes. He produced some of the greatest poetry in Chinese literature, expressing his fervent love for his state and his deep concern for its future. According to legend, his anxiety brought him to an increasingly troubled state of health. During periods of depression, he would often take walks near a certain well, where he would look upon his reflection in the water and see himself, thin and gaunt. In the legend, this well became known as the "Face Reflection Well." Today on a hillside in Xiangluping in Zigui, Hubei province, there is a well which is considered to be the original well from the time of Qu Yuan. In 278 B.C.E., King Chu was captured, and the capital, Ying, was taken soon afterwards by General Bai Qi of the state of Qin. Upon receiving this news, Qu Yuan is said to have written the lengthy poem of lamentation called "Lament for Ying" and later to have waded into the Miluo river in today's Hunan Province holding a great rock in order to commit ritual suicide as a form of protest against the corruption of the era. Popular legend has it that villagers carried their dumplings and boats to the middle of the river and desperately tried to save him, but were unsuccessful. In order to keep fish and evil spirits away from his body, they beat drums and splashed the water with their paddles. They threw rice into the water as a food offering to Qu Yuan and to distract the fish away from his body. However, late one night, the spirit of Qu Yuan appeared before his friends and told them that he had died because of a river dragon. He asked his friends to wrap their rice into three-cornered silk packages to ward off the dragon. These packages became a traditional food known as zongzi, although the lumps of rice are now wrapped in reed leaves instead of silk. The act of racing to search for his body in boats gradually became the cultural tradition of dragon boat races, which are held on the anniversary of his death every year. Today, people still eat zongzi and participate in dragon boat races to commemorate Qu Yuan's sacrifice at the Dragon Boat Festival (Duan Wu festival), the fifth day of the fifth month of the Chinese lunar calendar. Qu Yuan is generally recognized as the first great Chinese poet. He initiated the style of Sao, which is named after his work Li Sao, in which he abandoned the classic four-character verses used in poems of the Shi Jing (Book of Songs), and adopted verses with varying lengths, giving the poem a more flowing rhythm and greater latitude of expression. Qu Yuan is also regarded as one of the most prominent figures of Romanticism in Chinese literature, and his masterpieces influenced some of the greatest Romanticist poets in Tang Dynasty, such as Li Bai and Du Fu. Other than his literary influence, Qu Yuan is also regarded as the earliest patriotic poet in China history. The loyalty, and unyielding patriotism expressed in his poems embodied Confucian political ideals, and have served as a model for Chinese intellectuals to this day. Li Sao is also the title of one of the most popular qin (seven-stringed zither) pieces in history, found in 39 qin handbooks through 1946. With 18 sections (sometimes more), it is the longest piece in the Shen Qi Mi Pu (Handbook of Spiritual and Marvelous Mysteries, 1425) to have been played so commonly. The variety of related forms in which it appears emphasizes its prevalence. None of the versions tries to set the words of the poem to music, but a number of them have lyrics with references to the poem, and the titles in the Shen Qi Mi Pu, the earliest known score for this composition, refer in order to lines of the poem. The preface to Li Sao in Shen Qi Mi Pu, says that there are two qin melodies called Li Sao, one of 18 sections written by Qu Yuan himself, and one of 11 sections written by later people in memory of (Qu Yuan). It gives some biographical information on Qu Yuan, saying that he wrote Li Sao in despair after he had been slandered, wanting to persuade his sovereign of his loyalty and of the wisdom of his advice. However, the king did not take the advice and the country collapsed. Qu Yuan could not bear this and so he expressed these thoughts on the qin. Scholars have debated the authenticity of several of Qu Yuan's works since the Western Han dynasty (202 B.C.E. – 24 C.E.). The most authoritative historical record, Sima Qian's Records of the Grand Historian (Shi Ji, 109 – 91 B.C.E.) mentions five of Qu Yuan's works: Li Sao, Tian Wen, Zhao Hun (Summons of the Soul), Huai Sha, and Ai Ying (Lament for Ying). Ai Ying ("Lament for Ying") According to tradition, Qu Yuan wrote this poem in anguish as the Qin general Bai Qi marched his troops upon Yingdu, capital of Chu (in present-day Hubei province), threatening to invade. In the face of the imminent peril confronting his homeland, he was filled with fury and grief. The poem expresses his deep concern and worry for his country's fate, his pity for the people of Chu, and his anger at the country's self-indulgent ruler who had allowed this tragedy to befall them. Li Sao (Chinese:離騷; Pinyin: Lí Sāo), one of the most famous poems in Chinese history. The name is often translated as The Lament, but is also known as On Encountering Trouble. It is a poem of search, sorrow and disillusionment of an exiled minister of state. It is part of the collection known as Chu Ci (楚辭 Songs of Chu, sometimes Songs of the South), the oldest collection of Chinese poetry, and has about 2,400 words in 372 lines, divided into 15 sections. The influence of shamanism is dominant in the poem, as shown in the spirit-journey theme, and it shows strong ties to an earlier oral tradition. Jiu Ge (Chinese: 九歌; Pinyin: Jiǔ Gē; English: Nine Songs), a set of short poems published in the Chu Ci. Though it is called Jiu Ge, it actually includes eleven pieces: Dong Huang Tai Yi (东皇太一), Yun Zhong Jun (云中君), Xiang Jun (湘君), Xiang Fu Ren (湘夫人), Da Si Ming (大司命), Shao Si Ming (少司命), Dong Jun (东君), He Bo (河伯), Shan Gui (山鬼), Guo Shang (国殇), Li Hun (礼魂). Jiu Ge is the collection of the sacrificial songs polished by Qu Yuan and is among the finest examples of shamanic poetry to have been created in ancient China, featuring mythological content and elegant imagination. Jiu Ge is different from Qu Yuan's other works. Except for Guo Shang, the pieces for various gods are either written as dialog or in prose style, to express the love between gods that have aspects of human nature, and humans. This appears to be style of the love songs of that era. Qu Yuan’s authorship of Jiu Ge is often questioned. Yu Fu (Song of the Fisherman) This poem presents a conversation between Qu Yuan and a fisherman on a marshbank; when Qu Yuan speaks of his grief, the fisherman responds by getting into his boat and singing a Canglang Song, the meaning of which is that when government is clean it is fine to work with it, but when it becomes dirty one should be happy to leave it. Wang Yi chose to attribute Zhao Hun to a poet of the Western Han dynasty, Song Yu; most modern scholars, however, consider Zhao Hun to be Qu Yuan's original work, whereas Yuan You, Pu Ju, and Yu Fu are believed to have been composed by others. ↑ John Thompson Falling into Grief.Silkqin Retrieved October 14, 2007. ↑ John Thompson Marshbank Melody. Retrieved October 14, 2007. ↑ Ch'ü Yüan Li Sao.Chinapage. Retrieved October 14, 2007. Liu, Xiaofeng, and Michael Schoenhals. 1995. Will heaven ever reply? : Qu Yuan and the "Heavenly questions". Chinese studies in philosophy, v. 26, no. 4. Armonk, NY: M.E.Sharpe. Qu, Yuan, and Arthur Waley. 1955. The nine songs; a study of shamanism in ancient China. London: G. Allen and Unwin. "Qu Yuan (Chu Yuan), the great poet". This page was last modified on 31 July 2014, at 21:57.